Are you a newbie when it comes to shooting? Confused by the terms rimfire and centerfire when it comes to ammunition? We were all new once. So don’t fret…here’s the skinny. For the old salts who already know this stuff, please feel free to go directly to the comments. The author also wishes you to know that he will pretend that his feelings are hurt, if it makes you happy. Anyhow, what are the differences between these two types of ammunition? There are a few, but first we have to explain how a cartridge works. The simplest version is that an object — either a striker or a firing pin — strikes the back of a cartridge case (what some people mistakenly call a bullet). This agitates a tiny amount of a volatile self-oxidizing powder and causes it to explode. This compound is called the primer. That small primer explosion produces a tiny spark which ignites a larger amount of powder (the main propellant charge or gunpowder). The propellant explodes, producing exhaust gases. The exhaust gas, having nowhere to go initially, propels the bullet out of the cartridge, down the barrel and toward the target/attacker/deer…whatever you’re shooting at. How that primer is installed is the difference between rimfire cartridges and centerfire cartridges. In rimfire rounds — most people are familiar with common .22LR cartridges — the rim of the case actually has a small space about as thin as a piece of paper. Think of it kind of like a filled pastry or a dumpling like a ravioli. In that space, a filling — the primer compound — gets smushed into the edges, which get crimped down when the cartridge is made. What actually happens is a tiny dollop of wet primer compound is dropped into the bottom of case. The case is then spun until the primer compound collects around the rim, filling up the small space around the inside. The rest of the case then gets a bit of powder, a bullet is seated over it, then the whole thing gets crimped to hold it together. To discharge it, a gun’s firing pin strikes the rim of the cartridge, making it go bang and setting off the round. Hence the term rimfire. Centerfire cartridges work a little differently. The bottom of the cartridge case has a small hole punched in the center. Into that hole is pressed a primer cap with a small amount of primer compound in it. After this primer cap is inserted, the rest of the cartridge is assembeled. The propellant charge (gunpowder) is put in the case, the bullet is seated and the whole thing gets crimped together. To fire a centerfire round, a striker or firing pin hits the primer cap in the center of the cartridge. That causes the primer compound to ignite, sending a spark into the main propellant charge. That explosion propels the bullet, going through the same process described above. Boom, gases, bullet, you missed the deer. Again. Why are most cartridges centerfire, though? It wasn’t always that way. In the 19th century, there were a number of rimfire rounds that saw heavy use by civilians and the military alike. The Henry rifle was initially produced chambered for the .44 Henry, a rimfire rifle round, and the Spencer rifle was chambered for .56-56 Spencer. Other rimfire rounds were popular too, such as .44 Rimfire – a pistol round – and a few others, but only a few have hung on in the fullness of time. Centerfire rounds, however, quickly gained the upper hand and for very good reasons. First, centerfire rounds are generally more reliable. Rimfire rounds – for various reasons – seem to be more prone to duds. 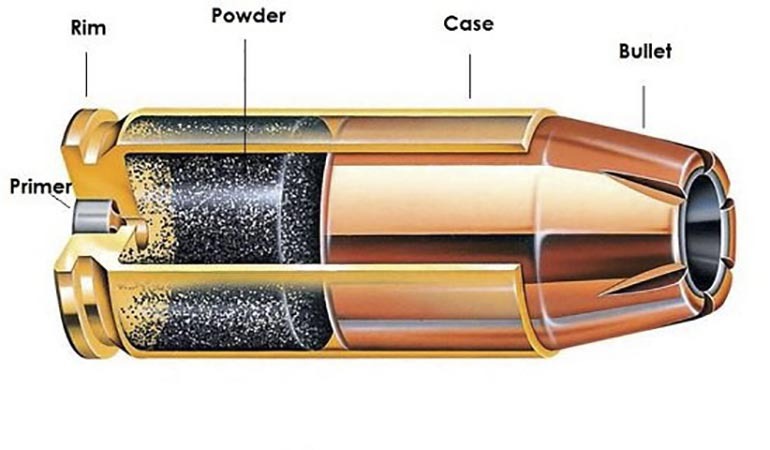 Centerfire rounds are also much easier to produce and (it must be said) safer to boot, since the first part of making a rimfire round is agitating the case with a volatile primer inside. Centerfire cases can also withstand much higher chamber pressures, which means cartridges can be made with MOAH POWAHHH! and that’s a valuable thing. However, there is a limit to centerfire rounds, specifically in size. Once you get down to about .23 caliber in a non-rifle round, that’s about the limit of how small a human or mechanical hand can easily and repeatedly make a cartridge. Today, the smallest you can get with any frequency is .25 ACP and even then not terribly often. In previous eras, the smallest was the 5.5mm Velo Dog, a small round literally invented (not making this up) for a pocket gun designed for French bicyclists so they could shoot aggressive dogs. However, a few rimfire rounds that were mighty popular about the time that centerfire cartridges took off – small rounds that were popular for shooting squirrels and such – hung around due to their usefulness for small game hunting and as target rounds. This was the .22 rimfire family, including .22 Short, .22 Long, and .22 Long Rifle with the lattermost being one of (if not) the most popular cartridges in production. The .22 Winchester Magnum Rimfire came along in 1959, too, and now there’s also .17 caliber rimfire rounds for shooting varmints. So, those are the basics of rimfire vs centerfire. The former is, today, limited to smaller rounds for target shooting, varminting and hunting small game. The latter does that and more. Smokeless powder BURNS. It does not explode. Black powder explodes. So true. I spilled some modern smokeless powder reloading once (ok, ok, it’s happened more than once). As I swept it into a dustpan I wondered “how will this burn”. It was WCF shotgun powder. I put the little pile on a brick and lit it on fire and guess what? It just burned, nothing exciting happened. true story. An excerpt from a Hickock45 video showing smokeless then blackpowder burning. A friend of mine asked what the difference between modern gun powder and black powder was. I explained that the former is a propellant, and the latter is an explosive. He said that they achieved the same effect. I sighed, then went and cut open a few fireworks and pulled some .22lr rounds with some pliers. I poured the powders out onto a flat Rock, then summoned my friend over. Since this was out in the middle of nowhere at night, I figured this would be a good demonstration. I struck a match and put it to the gunpowder. It burned slowly. I then struck another match and dropped it onto the black powder. Nothing. The flame had gone out. I moved closer, then tried again. Still nothing. I knelt down and struck the match, putting it almost immediately to the powder. It erupted with a flash, temporarily blinding me and singeing some arm hair. My friend, however now understood the difference and we both learned to never get frustrated with black powder. Neither black powder nor smokeless powder explode. Their combustion velocity doesn’t get near high enough to be considered an explosive. Even the detonation of a pipe bomb filled with black power or smokeless is not considered a chemical explosion. It’s actually a mechanical explosion no different really than when a rifle comes from together from a double charged round being fired in it. Black powder, when ignited, burns faster than you can blink. I would call that an explosive. You’re using the term explosion to mean detonation, which is common way of defining it. But technically detonations are supersonic explosions and deflagrations are subsonic explosions. They’re still both explosions. Mr. Hoober: You’re right, I already knew this stuff. But I liked the pictures. Good read. Would have liked to seen additional information on why rimfire primers tend to fail. I suspect vibration and heat cycles in storage tend to allow the priming compound to come loose from a section of the rim. I love shooting .22 but get frustrated with the FTF rate especially on the bulk pack ammo. I feel like I saw a video about this during the ammo “shortage”. The explanation was that tiny air bubbles can be in the priming liquid, so that when it dries, it leaves a pocket. I’ve heard often that 22 rimfire is more prone to duds. Strangely, I’ve fired many thousands over the decades, and never experienced a failure, even with bulk boxes. Lucky I guess. I think it’s caused by uneven coverage of the primer fluid. I actually used to try and salvage dud or mangled .22lr rounds, including scraping out the primer and collecting it. As you can imagine, that didn’t end well. However, lesson learned. Primers are not to be messed with. I think the failure rate in rimfires is due to difficulty in distributing the priming compound absolutely evenly around the inside of the rim. If even a tiny air bubble leaves a bit of rim unprimed, and the firing pin happens to hit that precise spot on the rim, the result is a misfire. This opinion is supported by the fact that a dud rimfire can almost always be made to fire by removing the round, and then rechambering the same round with the case indexed so the firing pin will hit a different spot on the rim. Excellent Article! I wish I had it several years ago to explain to newbies. You did forget the .22WRF but that is minor. I did not know the difference between Boxer and Berdan primers. And a pretty awesome little animation of all three types too. Sure wish this info had been around when I was learning how to reload back in the 1970s. I had to learn by books and trial and error. I had to find out how berdan primers worked by disassembling a live round. No books in montana on berdan priming. Probably could have found such had I been in Europe. Interesting irony, berdan primers were invented in the US, boxer priming was invented in Europe. The opposite of where they became popular. now i know the berdan/ boxer difference. i learned here that the standard .22’s have a stepped bullet that maintains a consistent outer diameter with the case, while the magnum cases are larger than the projectile. more info than most need. That’s why a separate cylinder is needed for guns like Ruger’s “single-six” to fire .22 Mag. The technical term for the stepped bullet designs like the 22RF is a “heeled” bullet, or a “heeled” cartridge. Nice article. Not everybody has been shooting since 1952. These foundational topics are worth covering once in a while. God help you if you go to some other forums and ask a question. No fewer than a dozen long time regulars will pounce on you for asking a question they’re not interested in or have covered before. “GO LOOK UP OLD THREADS BEFORE CREATING A NEW THREAD WITH OLD QUESTIONS! !”, they’ll shout. F that. I’ll just go look up my questions in reference sites and they can keep their little angry, insulated forum to themselves. Nice to see TTAG not falling into that routine. And what about matchlocks, and wheelocks, and touchholes? If you’re going to write a short article, make sure to cover everything! Rimfires I believe also make a weaker case? It’s what I’ve heard, also that they were not as dependable on ignition. I’ve worked with priming compound, lead azide, scary stuff. We mixed it standing in water with all brass tools, I was told you could get enuff under your thumb nail to blow your fingers off, very bump and spark sensitive. Just a glance at the animation will show how very much weaker the rimfire cases are. The rim must be very thin because the hammer (or striker) must have enough energy to crush both halves together over the priming compound to set off the round. This weakness in the rim limits the pressures that rimfires can operate at. If a rimfire round was strong enough to take, say 60K copper units of pressure, you’d probably have to hit the rim with a punch and a two pound ball peen hammer to get it to go off. A key point I’d add is that the short, long & long rifle ammo use a heel seated bullet of very soft lead alloy. The heel seated ammo (not represented in the rimfire diagram accurately) typically is more susceptible to oil or water contamination. Lots of the bulk packed ammo the bullet will twist in the case if turned by hand. Not a problem usually…but some think this makes the ammo less stable for self life. I agree. But if you mention this around the preppers who’ve invested during the “two brick” limits of recent past; filling spare rooms with stacked ammo ceiling to floor; it will induce anger or even rage. Smile politely, but buyer beware. From a damp basement or garage, the long term effects will be evident in performance of said stored ammo. Centerfire ammo is not as affected as rimfire in duration and quality of storage. The magnum rimfire uses a jacketed bullet that produces a much tighter fluid resistant crimp also. Now let the hate comments from people with rooms full of rimfire for sale, begin…. Actually, I’ll just respectfully disagree. I don’t have entire rooms filled with .22lr ammo, but I’ve scavenged and used some very messed up rounds, with oxidation of the case and bullet, not to mention loose fitting bullets and dented cases. I clean them up, then load them in. Most times if the rim has already been struck, a subsequent strike opposite the first will set it off. Also, the worst that happens is the shell has to be extracted with a pick of some sort, or pushed out with a long, narrow, stick or rod. That all said, I have had more dud rimfire rounds than centerfire rounds. If the round is very weathered, the primer may crumble and flake off into the powder, in my experience. Thanks for that explanation. Been shooting .22 since I was in grade school, but I’ve never got into self loading or anything, and often wondered why the bullet seemed so loose in them. Great info here. I can think of more centerfire cartridges with heeled bullets than rimfire ones. Mostly because there are a hundred times more centerfire cartridges than there are rimfire ones. Do a more in-depth one on boxer vs berdan, or corrosive vs non corrosive next! There really isn’t much to say about corrosive, or non corrosive. Non corrosive uses a compound that does not leave residue behind that will attack barrel steel. Corrosive primers use to compound that does attack steel. So, if you would like your bore to say unrusted, clean the bore with soap and water after every session shooting corrosive ammo. If that’s too big a hassle, and it is a pain, then use non corrosive ammo. I can’t think of much to add, other than a list of all the dozens of possible priming compounds, but I can’t see who would be interested, other than perhaps a chemist, but they would already know how to look that up for themselves. Yeah, I’m that nerd who’s interested in the chemical compounds. I suppose could look it up, or be lazy and ask TTAG to do it. OFC, it doesn’t include all of the possibilities, but it’s a good history and overview. Interesting, my girlfriend and I have a very different definition of what “rimfire” means but to each his own I guess. Excellent article for beginners. I think Am. Rifleman or maybe ShootersIllustrated did an in-depth article on rimfire about a year ago. I’ve had about 5 or 6 failure to fires with .22LR and about half happened with a BX trigger replacement on a Ruger 10/22 and CCI MiniMag ammo. I’m told that the brass on the MiniMag is harder than average. Also the hammer spring on the BX is weaker, so I replaced it with the stiffer stock spring. Supposedly, the rimfire primer contains ground glass as a frictioning agent, so a lack of that could cause a FTF. Usually I can re-chamber the FTF round by hand so as to strike a different part of the rim & it shoots fine. I’d say real explosions (C-4, semtex, dynamite) are detonations and none of the firearm stuff is. I think, but don’t know, that many .22LR primers are rather more powerful than “a little spark.” I’m pretty sure that the precision ammo manufacturers are very careful about putting exactly equal power primers in every round. Also, my Walther P22 shoots one HV round with 100% reliability and another HV round with exactly the same muzzle velocity often fails to cycle. Why? Probably because the first type has more primer and more snap to trip that stiff hammer spring. Good article and well written. I had to hand draw this when teaching my children 30 years ago, to explain the difference. A quick aside, it’s funny, but Boxer priming was a European development and Berdan an American one, yet most modern Berdan primed ammo comes from Europe (We won’t mention Blazer LOL), and Boxer primed is almost exclusive throughout the American Ammo Industry. This article would have made the demonstration easier for sure, and now that I’m beginning with my Grandchildren, I’ll use it. As far as the Blackpowder v. Smokeless Powder Explosives argument, it’s semantics and chemistry, refer to the UN table or DOT HAZMAT table and be done with it.